The City of Monrovia, our historic City, founded in 1822, 25 years before the Declaration of Independence in 1847. Monrovia was founded during the administration of President James Monroe for whom it was named. 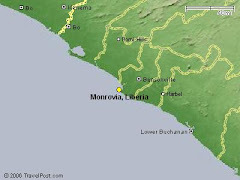 On February 8, 1922 the City of Monrovia, a Commonwealth District was enacted. Records show that Mr. James A. Brown governed Monrovia in 1835 and carried the title of President. Daniel B. Warner was the first to have the title conferred on him as Mayor in 1855. In 1922 the first Commissioner of the Commonwealth District of Monrovia was J. Samuel Dennis and the reign of Commissioners ended with Mrs. Ellen A. Sandimanie with Edward A. David becoming the First Mayor of the City of Monrovia under the new Act of July 19, 1973 with Monrovia once more coming a Municipal Government. 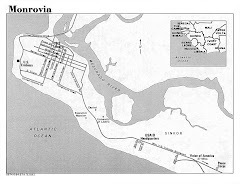 The metes and bounds of Monrovia were extended in the late 70’s during the tenure of President William. R. Tolbert. The Monrovia City Police-a constabulary force was the beginning of policing in the 1900’s, which was later nationalized to become the Police Force of Liberia. In 1973 when Monrovia was again granted a Municipal Government Status and once more the right to have a Charter, it created the Monrovia City Police as one of its Departments in the late 70s. On March 20, 1978, 25 Police Officers graduated from the National Police Safety Institute now the National Police Training Academy and they formed the first group of City Police men and were turned over the MCC by the Government of Liberia to enforce City Laws and Ordinances and to Protect Lives and Properties. The corporate status of the City of Monrovia (MCC) as it is now was established by an act of the National Legislature in 1973 creating the City Government comprising of The Mayor, who represents the Executive, The Common Council representing the Legislative Branch and the City Court representing the Judicial Branch. The City was once more granted a Charter that enabled it to create various Departments for the management of the City of Monrovia. In addition to this several ordinances were signed into law by the Presidents of Liberia mandating the City to undertake programs and levy taxes and other fees for the sustainability of the City. Sadly to state the City authorities have had a difficult time in fully creating and implementing its Charter due to the many changes that have taken place in the National Government since the 80’s. The explosive growth of Monrovia can be measured using almost any indicator of urban change by the scale and pace of demographic growth between the 50’s and the 80s, with the population reaching approximately 500,000 by 1989, by the concurrent rise in solid waste generation, given the success of the City’s economy, notably between the 60s and the late 70s and by the attendant attraction of labor into the City. Since the crisis of 1989 up to present, the population has increased to about 1.5 million. This rapid and unprecedented increase of the city population has wide-spread and severe effects on the environment and on the aged or virtually non-existent basic social services and utilities which now surpasses the capacity of the City Government to adequately cope. The City Government was further incapacitated during the renewal of hostilities in Monrovia in 2003 when all of its basic sanitation equipment and implements were looted. Monrovia now lags behind in the pursuit of environmental management programs. provides even greater opportunities for trade and investment. Associated with this period is the threat of epidemic outbreak and the spread of diseases resulting from overload carrying capacities, broken-down facilities and created conditions of over-crowding congestion of the City’s residents. The weather in Monrovia is humid. It is characterized by fresh air in evergreen surroundings and long stretches of undeveloped beaches. There are two seasons: Dry and Rainy with an annual rainfall around 170 inches. 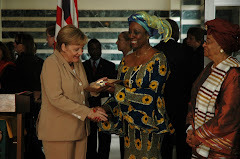 Apart from being the nation’s capital, Monrovia plays a pivotal role in national development. It is the principal and propelling engine of economic development. Monrovia is described as the “melting pot” incorporating Liberians of all ethnic groupings, citizens and other nationals of diverse origins and culture from Africans and non-Africans to include Asian, European and American backgrounds. The people of Monrovia are very warm and hospitable. The city of Monrovia has come a a long way. Monrovia has survived all the difficult years up to this point in its history.thanks to the hard work of the successive commissioners and majors of the City Corporation over the years. "We must clean the city"